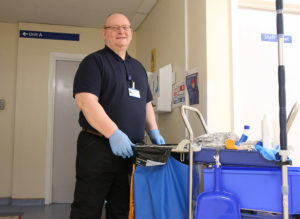 A LOCAL man has secured his first ever NHS job role – thanks to new opportunities created through a partnership between a health trust and college. Jeffrey Nicholson from Stockton is now working as a domestic assistant at the University Hospital of North Tees. This is thanks to joint working between North Tees and Hartlepool NHS Foundation Trust and Stockton Riverside College. Work placements are set up for college students like Jeffrey who are looking for the chance to experience working in healthcare. Jeffrey, who is 56, is completing a hygiene course at the college. He has previously worked in engineering and as an office administration manager. Speaking at the start of an evening shift, he said: “I must have applied for over 40 jobs at the NHS before without any success. “It’s fantastic that as part of the course I knew I would be able to get the opportunity to have a work placement in the NHS. “This work placement has made the difference – it has now helped me to secure this job role, which I am delighted about. Vicki Spinks, the trust’s workforce project manager, said: “These work placements have been a fantastic development in our ongoing work with the college.